1) In a bowl add the milk, sugar, salt, and yeast. Leave it for 15-20 minutes until it grows and starts bubbling. 2) Now mix the eggs into the yeast mixture. 3) In a mixing bowl add the mixture to the bowl and add the flour, butter, and olive oil. 4) Beat the mixture until it comes together and reaches a smooth and even consistency. 5) Place the dough in a bowl covered and let it rise for about 1 and a half hours. 6) Once done, transfer the dough onto a floured surface and roll out to 7 inches wide and 2 inches thick. 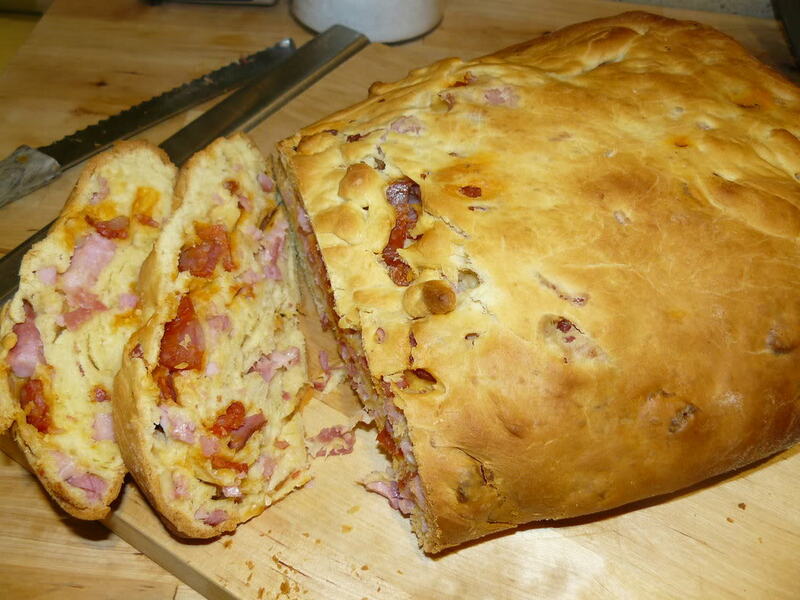 7) Lay the chouriço first on top of the dough and then add the ham and bacon. 8) Now roll the dough into a loaf with each layer having some of the meat. Press down on the dough as you roll it to prevent any bubbles or spaces in between the layers. Now add the dough to a loaf pan. Spread the pan with olive oil to make sure it does not stick. 9) Allow the dough to rest for about 30 minutes while covered until it risen a bit more. 10) Brush the top of the dough with an egg. 11) Then bake in a preheated oven at 390 degrees Fahrenheit for about 40 minutes to an hour until the the crust has become golden brown. 12) Once done, remove from the oven and let it sit for 15 minutes to cool off and then serve. I remember my great grandma making this bread. She baked hers in round cake pans. It was so delicious! I’m so glad that I found your website. I will try this recipe for Easter. A nice thick slice of this would make a lovely lunch with a salad or veg soup on the side. I only have access to dry yeast. Do you think It would work with this recipe? Because this dough is very rich, I imagine it is trickier to get it to rise. My parents make this for every holiday. For a loaf pan, they use an oblong tray from a culinary steam table. It makes a well-shaped, large and high loaf that’s perfect. A slice of folar and a tall glass of cold milk and you’re ready to take on the world. Awesome recipe. I added small cubes of manchego & provolone cheese. A .6-oz cube of cake yeast is roughly equivalent to 1½ to 2 teaspoons instant yeast or 2 to 2¼ teaspoons active dry yeast.